Singing Ayyappa bhajans and shouting slogans against Kerala communist Govt’s atrocities on Sabarimala devotees, hundreds of people congregated at the location and participated in the protest march, carrying placards displaying messages against the ‘unfair judicial overreach of Supreme Court’ on the issue, the connection of the missionary and divisive forces in India. 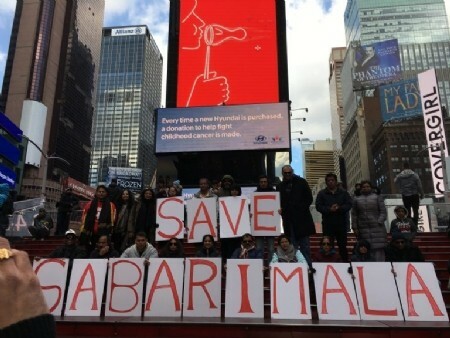 The protesting Hindus issued a strong statement on the Sabarimala issue and demanded to free Hindu Temples from Government control. Most of the participants in the rally were women. “Even if Supreme Court passed judgment, what is the reason for State Govt’s hurry to implement using such large police forces, resorting to beating and arresting unarmed devotees who were begging to respect traditions? There are many Supreme Court cases including the noise pollution of the Mosques 5 times a day, 365 days a year they have not implemented. Why would they appoint non-Hindus to Devaswom board?” a press release issued by the protesters stated. “The truth is the missionary/leftist combine want to convert the Sabarimala temple into ‘Museum’ and exploit the surrounding rich area and the money from devotees for corruption and other activities just as they did throughout the history to the native religions in the world (e.g, the pagan harvest festival is today Halloween with Black Friday sales activity in the US). The same secular Govt. loots the devotee’s contributions with hefty charges but provides land for a nearby church free,” the statement said.